"I started using enamel in school," answered artist Kirsten Everberg during her lecture at Otis College this past January. 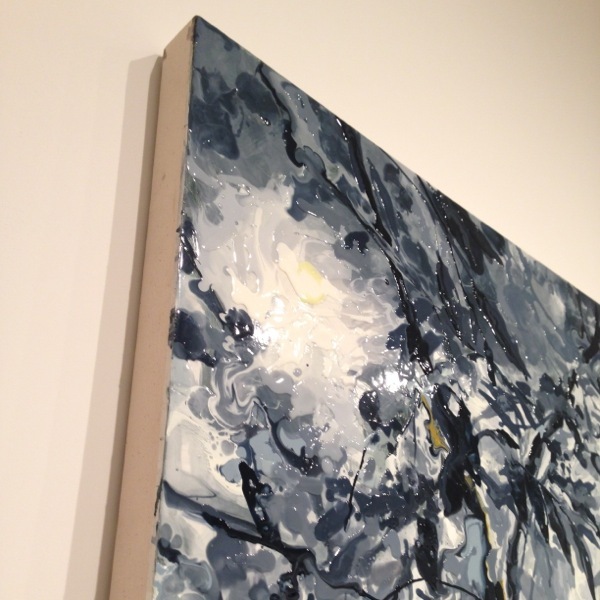 She was responding to a question from an audience member about when she started using the material in her paintings. "I started pouring it and drawing with it and it was really a way for me to have a lot of control and no control at the same time." 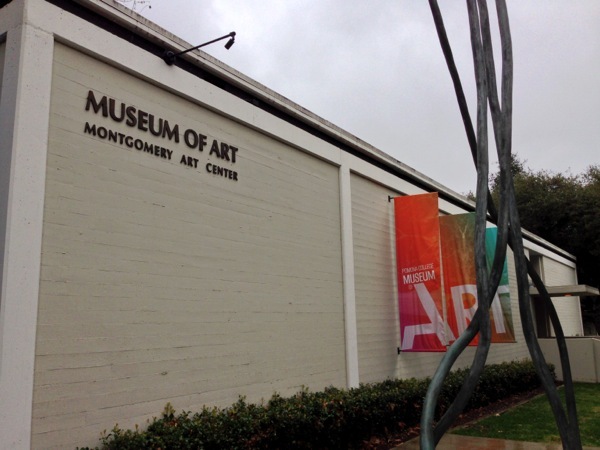 Everberg's talk was part of Otis' visiting artist lecture series and given in conjunction with an exhibition of her work at the Pamona College Museum of Art. 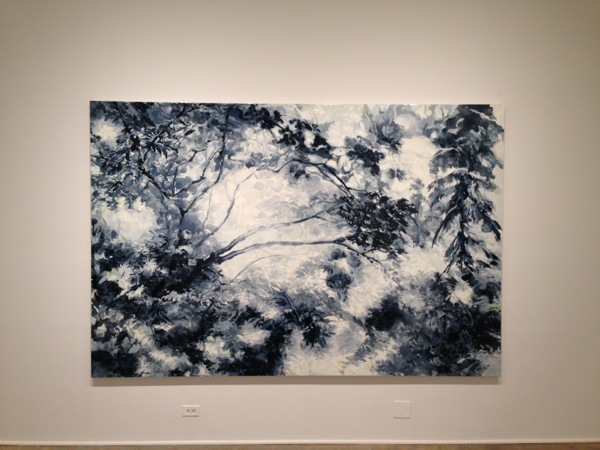 The exhibition, titled In A Grove, presents four new paintings by Everberg inspired by Akira Kurosawa's film Rashomon. In the film, the same story is told from the point of view of four different characters and Everberg has named the four new paintings in the show after them - Wife, Bandit, Woodcutter, and Ghost. But knowledge of the source material isn't necessary to enjoy Everberg's work as her paintings are as much about the act of painting as they are about anything else. A lot of painters claim to investigate the gulf between abstraction and representation but Everberg actually does with this work. 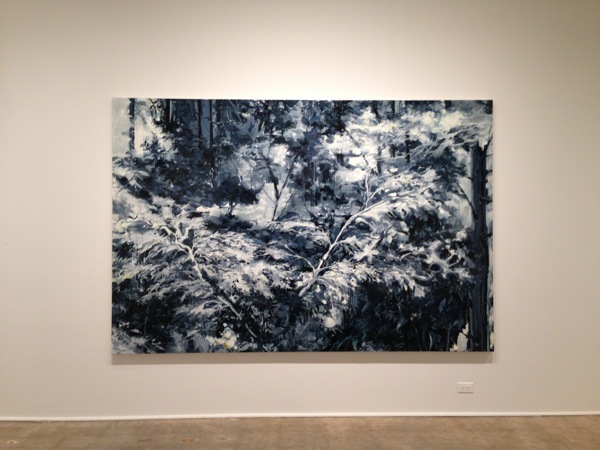 Her images, while giving the impression of a wooded grove, remain perpetually in flux. Each mark is open to the possibility of representing shadow, object, or reflected light but not certainly any of those things and possibly none of them - maybe it's all just pools of paint. By now, some other writer must have already pointed out the references in Everberg's work to Pollock's drip paintings but it's worth mentioning anyway because it's especially present in this work. Everberg had plenty of interesting things to say about painting in general and her work specifically during her lecture at Otis. Below are some excerpts from the talk. "I use two kinds of paint. I use Japan Color and I use enamel. All the paint on top is a really glossy enamel. I like the lack of control that I get with it because it's very viscous and it continues to move and be fluid so I can only control that a certain amount. I think for me that's truly something that I love to push against, that sort of tension between abstract and representation is perfectly suited for that material." "I started using enamel in school. When I was in undergrad we all wanted to be Laura Owens so we were all using, you know, as much masking tape as we could and painting on the edge...and when I started using enamel it was a way of getting a really clean line but losing the line at the same time. So I was able to kind of draw with it and paint with it at the same time." "I should also say it's an industrial paint so I don't get the huge advantage of artist's colors. I don't get all of the rich browns and great blues. I have to mix everything. So I mix everything off the panel and then apply it premixed." 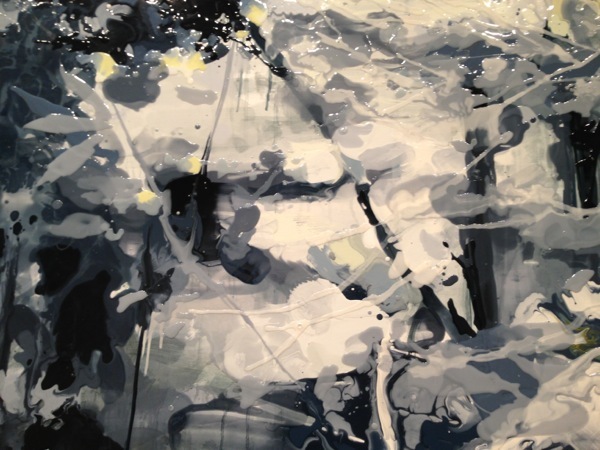 "I paint on the wall at [the underpainting] stage and then I lay it down and I paint it flat. Sometimes I use brushes or I pour it or use my hands, or any way I can get the paint to move around the way I want to." "Because I make most of the work flat on a table, I need some map to follow. So this is what I would call the transition part of the painting for me. I take my source material and I feed that through my computer and mediate it and then I translate it on the painting with this very loose underpainting. And then there's the interpretive part of the painting, which is a bit more intuitive, where the source material falls to the side and I end up developing what I might call and internal logic for the painting. So at some point the painting has this internal logic and you set it up and you can answer your own questions within the framework of that logic. You might know when you get to that point when you're making a film or a drawing, but at some point you arrive at this point where you're able to answer the questions...that come up in the painting, like a language." "I have this photographic practice that works its way into my painting practice and for me photographs are the way of organizing or seeing things and they give me something to shuffle around, to reassemble, to dissect and unpack. I also have this very analog way of using photography. I'm not super tech-y and super digital. I kind of cut them up with scissors and things like that." "It depends on how much time I have. It can take several months. I've taken three months to make a painting and it's not always better for having taken that much time. I can also make a painting pretty quickly and it's also not always better for having been made so quickly." 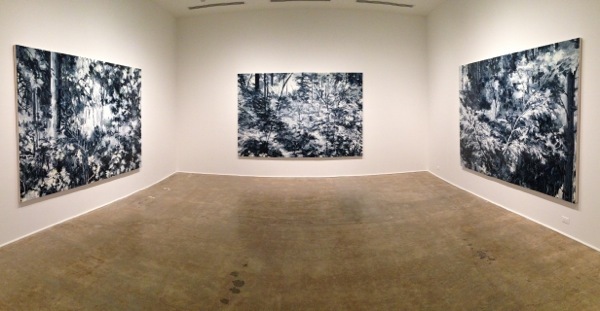 Project Series 45: Kirsten Everberg: In A Grove is on view at the Pamona College Museum of Art through April 14, 2013.